Smash has become one of the most popular gyms in the Bay Area because of our fun fitness classes designed to help people of all levels live a healthy and active lifestyle. Our beginner friendly classes have had amazing results helping people reach their fitness goals. We offer a safe and supportive path to reaching your fitness goals. Many of our members have commented that aside from becoming fit, our classes deliver an unique additional benefit. Each one of our specialty fitness classes is taught by expert professionals in each subject. At Smash people are learning functional skills in addition to function fitness. According to author David Grossman, the human population can be divided into three groups: sheep, wolves, and sheepdogs. Grossman says that most people are sheep. The vast majority of people are peaceful and would never purposely hurt another person. They lack both the ability and the desire. There is absolutely nothing wrong with being a sheep. If you are a sheep then you are probably a non-violent and productive citizen. Sheep are those who choose not to accept any responsibility for the protection of themselves or those around them. Sheepdogs are those with the ability to fight off the wolves. Sheepdogs are made not born. At Smash we are helping to turn sheep in to sheepdogs. As you are developing these skills and your abilities, your confidence will grow. You will know that if needed, you can protect yourself and loved ones from the wolves of the world. Our members are becoming a community of good people with a unique set of skills that most predators do not possess. All of our classes are taught by expert instructors in specific subjects. Our professional instructors are not only great practitioners but also have a plan to transfer their skills to you in a fun and safe environment. Take as many different classes as you can to soak up the knowledge of these amazing instructors. Get off those one-size-fits-all exercise machines and learn from an instructors that can transfer his or her expert skills to you. Self-defense and martial arts classes are becoming an incredibly popular way to get in shape and feel great. Through innovative, beginner friendly, and live training methods we are making good people skilled martial artist through their fitness journey. Men and women of all ages who never had martial arts or athletic backgrounds are experiencing things they never thought possible at Smash. Anyone will get good as long as they keep showing up. Our classes have a strong focus on safety during live but structured training. Injuries are very rare but a bruised ego is common. Everyone starts off the nail but if you can put your ego aside and keep coming to class you will become the hammer, we guarantee it. Once you are trained you will realize it doesn’t matter how tough someone is, it only matters whether they are trained or not. Anyone serious about self-defense or martial arts should at the very least get a blue belt in BJJ. Anyone serious about self-defense should take our self-defense and combatives classes and learn about knife or gun disarming. Learn how to properly punch and kick in a devastating fashion with our kickboxing and MMA classes. If you are missing classes on this schedule you are passing up an opportunity to not only burn calories in fun classes but to also learn potentially lifesaving skills. In today’s increasingly dangerous world many people are concerned about self-protection and want to learn to defend themselves. It can be a difficult choice on which gym to join so I would encourage you to get off the internet and try the classes out. At Smash we take our responsibility seriously to give our members the tools to protect themselves. Properly researching gyms or styles of fighting can only be done through visiting gyms and testing the the quality of instruction and training methods. Look for instructors and students that are able to demonstrate the effectiveness of their skills in a 100% live situation without hurting you. Good marketing and bold statements does not make realistic self-defense. Pretend fighting with no rules in unlikely scenarios will not help you in when you need it most. Most importantly, look for instructors and training partners that posses a sheepdog mentality and the drive to protect and help people in all aspects of life. Find a community of people inspiring each other reach their goals and grow together. The instructors at Smash Gyms are life-long martial artists with various backgrounds of different self-defense and martial arts disciplines.We were there when the fight world was shocked during the original UFC’s which proved that a knowledgable grappling specialist could easily manhandle other high level martial artist who lacked real grappling knowledge. This brought attention to the fact that for decades the Gracie family had open challenges to other martial arts and fighting styles and had defeated countless opponents in no rules fights. We put our ego’s aside and went through hard training to develop real skills, and came to the realization that our past training in combat systems with unrealistic training methods had little value in a real fight. Through the evolution of sport fighting and MMA in the last 20 years it has become apparent that combat sport styles did very well in real combat situations. This was because of training methods. They go 100% live and test techniques. If you go 50%, you are not going live. Theories, techniques, and strategies must be tested. You must try to prove their effectiveness and not just take your instructors word for it. Sport fighters train this way and have evolved sophisticated systems of fighting. Skills in these sports have been passed down from generation to generation and evolved to be as effective as possible through natural selection and a scientific process. Professional fighters, police departments and even the US Army replaced old systems with these disciplines because the effectiveness could be proven in 100% live situations. Many lifelong martial artist came to the realization that although it was a jagged pill to swallow they needed to learn these arts after losing to these sport practitioners. Specialist in different fighting sports became hot commodities as coaches for any serious martial artist or fighter. People who were paying attention learned that you could not be successful learning from one style. Jack of all trade fighting styles proved to be a beginner systems at best. The best fighters in the world learned they need a coach for each discipline. A specialist trainer is one that has spent the 10+ years it takes to master a real skill. Fighters realized that to reach a high skill level they needed to get out of their comfort zone, put their ego aside and step into the world of the specialist. They learned that they need to lose in 100% live situations until they could win in 100% live situations. This is how to develop real skill that is repeatable in a live situations. While the UFC and MMA in general grew in popularity, many traditional martial artist took refuge in claiming that their style was too dangerous to prove in a real fight. When they did go live with people that understood how to produce a real skill it became obvious that practitioners of these untested fighting styles typically did not progress beyond beginner level technique in actual combat, even after many years of training. Ironically these styles are the ones that usually claim to be the most “realistic”. Many of these styles focused preparing on a mentality for certain situations that never happen to make up for their lack of realistic training methods. When these unfortunate practitioners actually were challenged they were not ready for the intensity due to the lack of 100% sparring, and their curriculum of untested, unproven techniques. They would be dominated by specialist every time. Many styles or instructors claim to have the best answers to every question. They may claim that they have the answer to beat everyone in every situation. This comes from insecurities or marketing. It may seem like confidence but it’s a rouse to control students and instructors to hide their “styles” weaknesses. We all have weaknesses. Those that won’t admit it, often have the biggest ones. The truth is that if you only take MMA, Krav Maga or other general self-defense fitness classes it will be difficult take reach a true level of mastery. Individuals with existing skill sets in focused combat sports will easily dominate in those styles. You will need to take lessons focused on individual disciplines from true experts in each subject if you are serious about becoming effective in self-defense and martial arts. There are no short cuts. If you want to truly learn a subject you need to see an authority on the matter. To combine kicks and punches at the highest level you need to find a kickboxing coach. To learn to stop or execute a takedown you need to study wrestling and judo. You simply will not be able to execute or defend against those willing to do it. If you want to dominate, control or submit an attacker in a one on one fight you should take BJJ classes. If you want to learn to knife fight then find an expert! No fighting style is an expert in every situation. For a Martial Artist to evolve techniques, strategies and methods must be tested in unchoreographed 100% live training. Practitioners must be scientific about their training. Don’t just take your instructors word for it. Make it work live. True testing must occur with live resistance. In real life nothing is perfect. When an instructor shows a technique he is showing an example of an exact situation. When you go live there are an infinite amount of variables that could happen. This forces the practitioner to react and adapt the technique in a way to make it work. This leads to a deeper understanding and then to mastery. To reach the highest level in anything, you need focused instruction. Many times the fighting styles that will give you cliff-notes of other arts were started by a “guru” that actually went and learned from specialist! They went to experts and put in the time and became skilled. You should do the same! Go to the source. If you go to one person to learn everything you are likely learning watered down 3rd or 4th hand information. In any area, there are experts that truly understand. You must spend the time in their world to really be effective. If you aren’t losing, you aren’t really learning. It is important to distinguish between scenario training and live training. Training partners pushing you with pads then letting you win during a difficult drill is not real fighting no matter how challenging it seems. Combat is not a religion. Martial Arts have come so far in the last 20 years and many people still don’t get it. Time and time again people have marketed end all be all to fighting styles with no substance. The best instructors have an open mind and continue to learn and evolve on their own and pass that on to their students. Fighting has been around since the beginning of time and it is now evolving at a breakneck pace. Because of the internet our ability to find, share, and test information is easier than ever before. You can find live footage of what works. There are thousands of real fight videos online. You will see virtually no fights end in groin shots, eye gouges and other “dirty ” techniques that many claim take the place of real skill. You will only fulfill your potential by getting out of your comfort zone, putting your ego aside and find true experts that are willing to show you their skills in a 100% live situation. If this idea seems sacrilegious to you then you are part of a cult, not a fighting style. Veteran martial artist have seen trends come and go and then repeat. Even now every few years a new heavily marketed fighting style shows up late to the party claiming to be the end all be all answer to fighting. These new styles are often popular because they protect the fragile ego’s of the students and instructors. It is traditional martial arts packaged as realistic scenario training without the real training methods. Those with experience know this is nothing new and has been proven to be ineffective over and over. Below is realistic close combat weapons training. They use a paintball gun so you can see who really gets shot! Many theory based “experts” may criticize techniques used to win during this live test without but are unwilling to prove it in a live situation with experienced combat sport athletes. Also they may totally disregard the results of the test due to years of being heavily influenced with untested theory. If you train live you will see that individuals with combat “sport” backgrounds will dominate other styles with very little training. Two brand new evening classes starting in May! Both classes are a great workout and fun! Our Self-Defense & Combatives classes will provide members with top quality instruction in a wide variety of subjects. This beginner friendly & new class will feature our Women’s Personal Protection curriculum as well as Jiu-Jitsu Combatives (the base of US Army Combatives). You will recieve instruction from experts in a wide variety of subjects. The various classes that make up the Smash Gyms Self Defense System will not only develop a student’s skills, but also help them get into great shape. Due to the fact that each class addresses a specific and different aspect of self-defense, the workouts are fun, interesting, and challenge the body. These classes will make anyone aware, ferocious, ready and in shape to defend themselves in any situation. Due to popular demand we have also added evening Mixed Martial Arts Classes! This program is truly a mix of martial arts and does not necessarily refer to the sport of MMA. Each subject at Smash is covered by expert in his field so this class is an amazing compliment to our Self-Defense and Combatives class. The Smash Gyms MMA program includes a systematic blend of Brazilian Jiu-jitsu, Wrestling, Judo, Kickboxing & Self-Defense techniques into a comprehensive weekly training program that will safely progress beginners at an accelerated pace. Our classes are designed as a path for the average person to progress safely and quickly into a well-rounded and fit martial artist. Our programs have proven to be highly effective in Self-Defense, Kickboxing, MMA, and Brazilian Jiu-jitsu sport competition. These uniquely structured classes are presented in a format highly conducive to learning while maintaining a strong focus on safety. If you really want to learn any subject you need to see an authority on the matter. No single fighting style has true expertise in every situation or subject matter. Anyone that has studied martial arts or fighting knows this is true. If you look at the best professional martial artist and fighters in the world they have sought out experts in each subject. They have separate expert coaches from each discipline. We used this principle to create our Mixed Martial Arts and Self Defense & Combatives programs. Every class subject will be taught by an expert for the highest possible level of instruction. In both classes gaining actual fighting ability is of primary concern while maintaining a strong focus on fun, fitness and safety! Increased crime and a shrinking police force in San Jose and the rest of the Bay Area has created a large influx of new inquires to Smash. 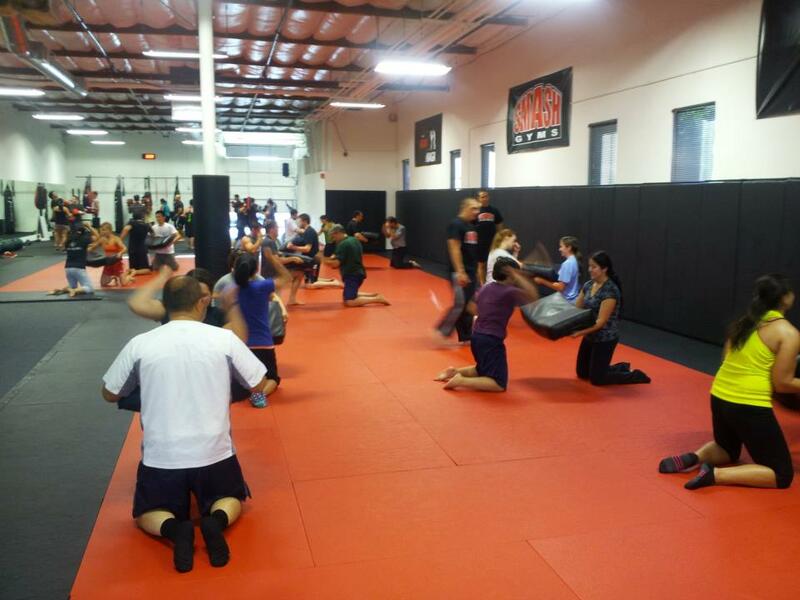 Many people are interested in Krav Maga, Kickboxing, Brazilian Jiu-Jitsu (BJJ) and overall self-defense. Our existing members are training hard to increase their physical fitness and to develop a strong skill-set to have confidence in their training and day to day life. All the fitness & Self- Defense classes at Smash create a comprehensive schedule that allows anyone to get the best shape of their life and learn life saving techniques from world class instructors.